Save your waistline and skip the typical cranberry sauce recipes that are just loaded with sugar! 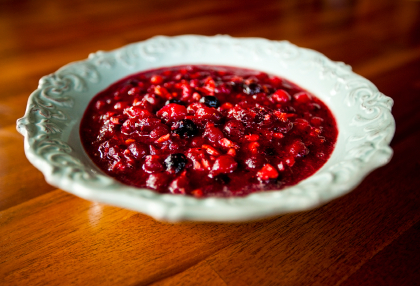 Trust me, this spiced cranberry sauce recipe tastes so much better anyway! 1. Bring orange juice, apple juice, orange peel, cinnamon, nutmeg, and ginger to a boil in medium saucepan over medium-high heat. 2. Add cranberries. Reduce heat to medium-low; cook, uncovered, for about 10 to 12 minutes. 3. Add pecans, raisins, and pineapple; cook for 2 minutes or until heated through. 4. Remove from heat and stir in maple syrup. This looks delicous and so much healthy then any store rendition!